Prince Charles and Home Secretary Jacqui Smith have attended a National Police Memorial Day service. They met relatives of fallen officers after a ceremony at Liverpool Cathedral attended by more than 1,000 people. Joanne Terry, whose husband Ian was shot in the chest on a training exercise in June, was among those who spoke to the prince after the service. The memorial event was organised by the Police Roll of Honour Trust which was founded five years ago. In his address, the Bishop of Liverpool, the Right Reverend James Jones, said: "We should not acknowledge the bravery and sacrifice of the police without at the same time identifying the pressures that we as a society place the police under." Later four candles were lit representing the police forces of the four countries of the UK. 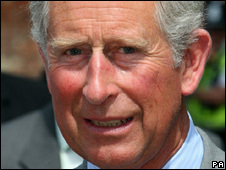 A scroll with more than 4,000 names of officers on the Police Roll of Honour was presented to Prince Charles by Mary Henry, the widow of Pc John Henry, of Bedfordshire Police. Pc Henry was stabbed last year responding to an incident on Luton High Street. After the service the prince met the families of fallen officers, including Pc Kate Parker, whose husband, Pc Andrew Parker of North Wales Police, was killed in a road traffic accident three years ago. She said his death inspired her to join her husband's force last year. Accompanied by her children George, six, and William, seven, she said: "The service was absolutely perfect and I'm very, very proud today. "I can't thank the organisers enough for what they have done to help families like mine." Home Secretary Jacqui Smith said: "It is right that once a year we stop and take time to remember those people who dedicate their lives to the police service and have lost their lives." Sir Ian Blair, commissioner of the Metropolitan Police, said: "It was a very moving service in a very, very beautiful cathedral. "I am very proud this annual service has taken hold because police officers, every time they go out of the door, risk their lives and it is only right that we remember them and their families." 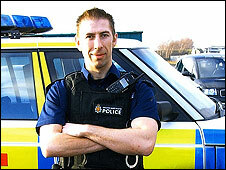 The trust was started by Pc Joe Holness, of Kent Police, after the death of a colleague while carrying out road safety checks. Nine police officers have been added to the roll of honour in the past 12 months.